In contrast to the bow, crossbow bolts are locked into firing position without much effort required from the shooter. The shooter can thus wait for an appropriate target for an extended time. He does not need to have the skill and power of a professional archer; crossbows can be used by non-martial fighters. Only putting tension on the crossbow requires effort, but it took time, so an archer could shoot many more arrows than a practiced crossbowman. The crossbow consists of two distinct parts: the characteristic curve and the transversely placed prod (or lath), above which the arrow rests in a flight groove. The locking mechanism, called nut or catch, holds the arrow until the shooter actuates the trigger. At the same time, the crossbow has greater tension force than the bow, so while the crossbowman did not have a larger range, he had greater penetrating power. Crossbow bolts penetrated every armor. Even a small boy could use a crossbow to shoot a knight from his horse, even if the knight was protected with expensive iron plate, and kill him with a skillful shot. The use of the crossbow was quickly ostracized and prohibited by the Pope in the 12th century at the Second Lateran Council. The ostracizing of the weapon, which could entail excommunication, did not, however, prevent its use on the battlefields of Europe. To this end, it brought many benefits. During the Crusades, in fact, it was regarded as a just weapon to use against the Islamic fighters. The Byzantine princess Anna Comnena (1083–1150) was impressed by the penetrating power of the crossbow in the First Crusade (1096–1099), and the Christian crossbowmen were meant to have killed their opponents immediately, without forcing them to suffer great pain. Crossbowmen were at first, however, in an inferior battlefield position compared to archers. In order to hold the same shooting frequency as archers, three or four times as many crossbowmen had to be placed in the army. Under Charles VII of France, each crossbowman had an archer at his side to protect him. Crossbowmen’s marksmanship suffered as a result the roughly manufactured crossbow arrows, which were shorter than traditional arrows. In spite of a given targeting device on the crossbow, the shooter could not hit his targets as well as a trained archer, because crossbowmen were no practiced shooters. Their training was quick and simple, and there was a lack of crossbow guilds in Germany and Europe at large to provide capable crossbowmen to armies (with the exception of Dutch citizens, Venetians, Genoese and Saxons). Other drawbacks were the difficulty of actuating the heavy trigger as well as vibration during the launch of the crossbow bolt, which further minimized marksmanship. The crossbow was used mainly during sieges. The defensive or siege crossbow, the rampart crossbow developed in German Wallarmbrust as a distinct model, whose arrows often reached the double or triple the weight of normal crossbow arrows. In doing so, the crossbow was safely tensioned behind castle and siege walls and were shot at suitable targets. In Falkenstein castle in Saxony-Anhalt (Germany), the impressive embrasure in the castle walls are preserved, walls which were designed to attack the enemy from all directions simultaneously. The cumulative occurrence of crossbows has been documented in Europe since the 10th century. At this time, the walls of towns and castles had been altered such that they gave crossbowmen better shooting opportunities. In cities of German-speaking countries, the crossbow was popular among their citizens, because it was a counterweight to the powerful German nobility. In Germany, unlike in other European countries, the crossbow was widespread in both the military and in society. This also explains why Germany and Austria have such large spectra of crossbow bolt finds. As a hunting weapon, the crossbow was much sought after. For poaching in the baronial forests, the crossbow was superior to muskets due its soundlessness. As in war, unique crossbow bolts were developed for hunting game. As well, women used crossbows to hunt small game and birds. Younger marksman also used crossbows that shot clay balls and small stones. Although the crossbow already appeared in China during the Bronze Age and the Greeks knew it as the “gastraphetes” and used it for hunting in Southern Europe during age of the Roman Empire, there is no evidence of everyday crossbow use between the 5th and 10th centuries. Their emergence in the 11th century is surprising and serious, as they spread throughout Europe. Indeed they had already been used successfully in the 10th century during sieges; however, they were only found in Western Europe and Scandinavia at this time. In arsenals, castles and museums, mainly crossbows from the Late Middle Ages can be seen, which were elaborately adorned, made of ivory and were used only for hunting. Light crossbow bolts reached weights of up to 35 g from the 12th to 16th century. Larger exemplars, however, can reach up to 50 g and beyond and are mostly dated to the 14th to 16th century. The first crossbows were tensioned with the hand and did not have the striking force that crossbows from the Late Middle Ages had. 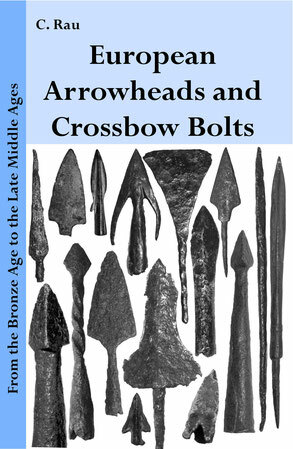 The earliest crossbow bolts do not show any significant differences from arrowheads. Archers also tried to penetrate their opponents’ armor with four-sided arrowheads. The socket diameters of crossbow bolts and arrowheads are the same in the 11th and 12th centuries. Only the distinct doublepyramid-shaped blade tips of the crossbow bolts and their greater weight make them unsuitable for typical bows. It was only in the Late Middle Ages that arrows’ socket diameters became larger due to their improved energy transmission. Later, crossbows were tensioned with windlasses in the 14th and 15th centuries and were thus able to exert higher pressure, leading to increased energy in the arrow. Their range in good weather was between 250 and 350 meters. Crossbow bolts had much shorter wooden shafts than bow arrows did. Typical lengths were between 30 cm and 60 cm. In the dungeon of the Churburg in South Tyrol, well-preserved crossbow bolts with feathers were found, the longest shaft of which was 40 cm. The entire arrow, with a heavy bolt, can weigh more than 90 g.
The crossbow was equal, or even superior, to primitive firearms in penetration power for a long time. At the beginning of the Modern Era, its importance in battlefield waned until it was completely replaced by firearms. For hunting, however, it was still used and was developed into a popular sports weapon. Left picture: A rare, armor-piercing, square crossbow bolt with a slender, strikingly short, socket. The four-edged blade changes from a square to a rectangle (see blade cross-sections). These exemplars differ only slightly from bow arrowheads. A safe classification cannot usually be given. The illustrated exemplar, despite its elegant design, was likely intended for the crossbow. The socket diameter is only about 1 cm. A prominent feature of these spicular shaped crossbow bolts is the length of the blade tips compared to the length of the sockets. Even if the socket is severely damaged by corrosion, the depth of the socket in this example is only 1.2 cm. In spite of its low weight, this is a military variant, although hunting uses may well have occurred. Such blade tips for bows and crossbows were mainly meant for chain armors and warriors who were armed in linens. The weight of the illustrated exemplar is 13.6 g, and the total length is 10.1 cm. Other bolts: The crossbow bolts of this form-family are also commonly referred to as “house arrows” or “Hussite bolts”, because they were widespread and were found in every castle, town and army. They were produced en masse and partly with the hammer forged in raw condition and put on wooden shafts. Crossbow bolts with a triangular tips and long conical sockets are found mainly in Spain, France, Germany, Switzerland and especially Italy. The precursors of this blade form derive from the three-sided arrowheads of the bow. The tip and the convex cutting edge are clearly relocated, as marked by the socket. The convex cutting edges are 1.7 cm in length and 1.1 cm in width. The unusually long socket is 4.7 cm. The tip is clearly recognizable from the tapered socket. Some exemplars have short barbed hooks at the ends of the edges. Very rarely does this type reach a weight of more than 60 g. The average weights are between 15 g and 25 g. The triangular and quadrangular blade tips can have different dimensions, and thus, the total weight can vary. A variant of blunt pyramidal or triangular blade tips, whose side edges are rounded. Its distribution period was in the 15th and 16th centuries. For hunting, crossbow bolts with barbed hooks were used, which remained stuck in the body of the animal and made the escape more difficult. An accurate distinction between an arrowhead and a crossbow bolt of this type is difficult. 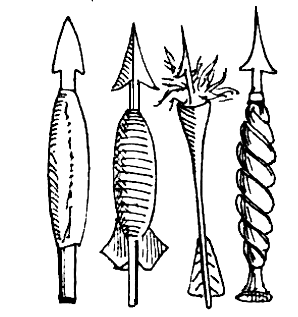 The differences between arrowheads with barbed hooks are marginal. Because of their increased energy transfer, crossbow bolts are often more solid and heavier than arrowheads. In the above figure, the crossbow bolt has been forged with a massive barbed hook. The other had already broken off after an impact before the bolt was salvaged. A larger socket diameter can give another indication of crossbow use. A squat, square, double-pyramid bolt with a solid, flat tang from the Baltic States. The wooden shaft was provided with a slit at the top, in which the bolt was placed and secured with animal glue and thread. Bolts with this mounting are unusual and rare. The most common form of attachment for crossbow bolts is socket fixations. The tang fixation was more cost-effective. However, such form-types with wide short tangs pose questions about power transmission. A hard impact would split the wood shaft, since the wide tang would act like a wedge. Sporting crown bolts: Crossbow shooting for sporting purposes had long, respectable tradition in Germany. The best-known crossbow shooters’ society in Germany had been that of Dresden, which was immortalized in a 1612 drawing by J. Kellerthaler titled “Dresdner Vogelwiese.” During annual competitions in the presence of the royal family, the society members shot a wooden bird dummy mounted at a height of 136 feet on a wooden structure to pieces. Whoever hit the heart of the “bird” made the “king shot.” It was shot with crown bolts of various shapes. If the bolts were sharp, they would only get stuck in the wood. The goal, however, was to destroy the structure. As a result, almost all competition bolts were dull. Crossbow arrows were provided with the name of crossbowman, since misplayed crossbow arrows were returned to the crossbowmen. Similar competitions took place in France and Belgium. Sporting crown bolts can also have spherical or pyramidal tips. Rare crown bolts from the 16th and 17th centuries had pyramidal tips and massive octagonal shafts, upon which a fixated brass collar was attached. The total weight of this fire bolt is 20.3 g. With a length of 9.9 cm, it has an average length for crossbow bolts from the 14th to 16th century. The size of the fire basket is 6.8 cm; each side is 1.7 cm, and the wing diameter is only 0.9 cm. Fire arrows were used quite frequently to cause the enemy trouble. For example, the Hussites used fire arrows in the sieges of Bautzen, Germany in 1429 and 1431 to cause large-scale fires. The city could the successfully defend itself, but contemporary representations show large fires in the city. Another typical use of fire bolts was, for example, on September 14, 1429, in a bloody feud between the citizens of Old and New Prague. In the case of infantile disputes, fire tips with barbed hooks were also used, which jammed into the roofs and triggered larger fires. The myth that crossbow bolts were often heated in order to shoot a glowing tip at the enemy, however, can no longer be proven. The right-hand historical illustration shows four different German fire bolts from the 15th and 16th centuries.